This page provides general instructions on how to use the OptiHub for integrating external devices with Flex series mocap systems. The OptiHub not only provides power for the USB cameras, but it also includes external sync in/out ports for integration of external devices. With proper configurations, you can have another device (master) control the mocap system or have the mocap system control another external device (slave), or both. Setup instructions for both slave and master devices will be covered. Note that the sync setup may vary depending on the type of integrated devices as well as the morphology of the communicated sync signals. Use this guide for understanding the general idea of how external devices are implemented, and apply it to your own needs. On the OptiHub, there are one External SYNC In and one External SYNC Out ports for connecting external devices. In general, master devices connect to the input port for controlling the mocap system, and slave devices connect to the output port to be triggered by the mocap system. Once the devices are connected, the input and output source needs to be configured under the OptiHub properties in Motive. Please note that the OptiHub is not designed for precise synchronization with external devices. It is used to provide only a rough synchronization to a trigger event on the input/output signal. Using an OptiHub, there will be some amount of time delay between the trigger events and the desired actions, and for this reason, the OptiHub is not suitable for the precisely synchronizing to an external device. To accomplish such synchronization, it is recommended to use the eSync instead along with an Ethernet camera system. Unlike the eSync, the OptiHub cannot generate an output signal at a higher frequency than the camera capture rate. 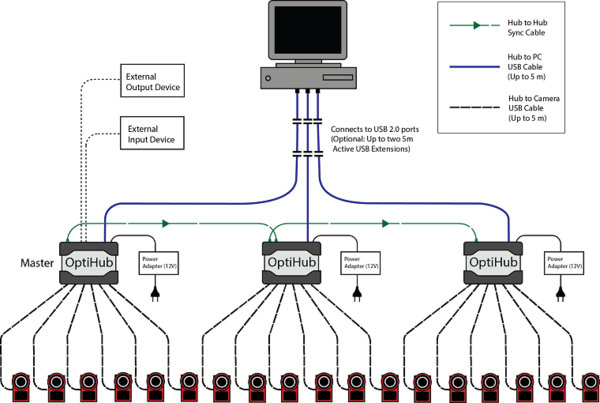 When using multiple OptiHubs, input and output ports of only the master OptiHub can be used. The master OptiHub is the first OptiHub within the daisy-chained RCA sync chain. Duo/Trio Tracking Bars: For Tracking Bars, use the Sync In/Out ports on the I/O-X USB hub. Step 1. [Hardware] Connect a master device into the External SYNC In port of the master OptiHub. Step 2. [Motive] Launch Motive. Step 3. [Motive] Open the Devices pane and the Properties pane under the view tab. Step 4. [Motive] Select the master OptiHub in the Devices pane, then its properties will get listed under the Properties pane. Step 5. [Motive] Under the Sync Input Settings section, configure the source and the corresponding settings. If you are using an external device connected to the External SYNC In port as the sync source, set the input source to Sync In. See more under the Input Source section of this page. Step 6. [Motive] Once above is configured, the camera system will capture according to the input signal, and you should be able to see the change in the Devices pane camera frame rate section. Step 1. [Hardware] Connect a slave device into the External SYNC Out port of the master OptiHub. Step 3. [Motive] Open the Devices pane and the Properties pane from the view tab. Step 4. [Motive] Select the master OptiHub in the Devices pane, then its properties will get listed under the Properties pane. By modifying the properties, you can configure the for outputting sync signals to the slave devices. Step 5. [Motive] Under the output section, set the output signal type. This will determine the signal characteristic that the slave device will receive. See the Output Source section of this page for details. Step 6. [Motive] Once this is set, the OptiHub will output configured signal through its output ports. The when the sync source is set to Internal/Wired the camera system uses the OptiHub as the sync source. This is the default configuration which uses OptiHub's sync protocol for synchronizing the cameras. The Master OptiHub will generate an internal sync signal which will be propagated to other (slave) OptiHub(s) via the Hub Sync Out Jack and Hub Sync In Jack, and all of the cameras connected to the OptiHubs will be synchronized. For V100:R1(legacy) and the Slim 3U cameras, Wired Sync protocol is used. In this mode, the internal sync signal will still be generated but it will be routed directly to the cameras via daisy-chained sync cables. When the Internal Sync is selected as the sync source, Internal Sync Freq (Hz) can be set under the Synchronization Control section. This setting determines how the OptiHub triggers the camera exposures or the camera framerate. When synchronizing the camera system to an external device, set the source to Sync In, and the camera system references the external signal through the SYNC In port as the master sync. In this mode, the Input Trigger event must be defined so that the camera systems respond to the incoming signal as desired; available triggers are Either Edge, Rising Edge, Falling Edge, High Gated, and Low Gated. Note that the suitable event will vary depending on characteristics of the received signal and how you want the system to synchronize with it. For syncing to input signals with a frequency higher than the supported camera frame rates, the Input Divider can be applied so that the sync source is downsampled to the supported rate range. This mode is for customers who use the software development kits and would like to have their software trigger the cameras instead. Using the provided API, the OptiHub will can receive the trigger signal from the PC via the OptiHib's USB uplink connection. Imager Scan-Rate: Frame Rate Setting defined under the Devices pane. 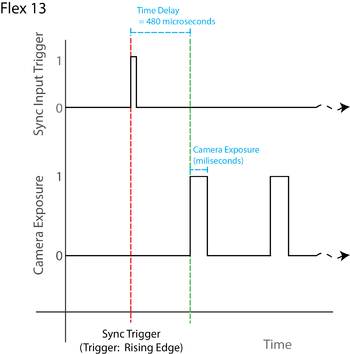 Flex 13 cameras have a different trigger-to-exposure latency. From the moment the sync trigger event is received, it takes 480 microseconds for the cameras to synchronize and start exposing. After this delay, the Flex 13 cameras expose for the duration defined under the exposure settings in the Devices pane. The camera exposures are measured in microseconds for Flex 13 cameras. 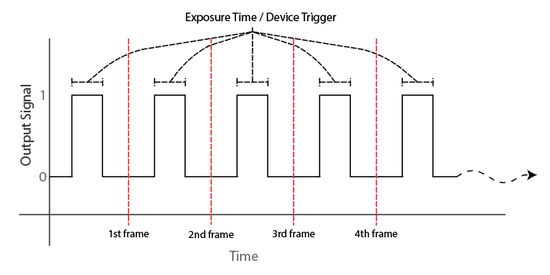 Trigger to exposure delay in Flex 13 cameras. Using the BNC splitter for connecting additional slave devices. The External SYNC Out port of the OptiHub can be used if you want to set up the camera system to be a master of other systems. The output port sends out the sync signals which can be configured under the External Sync Ouput section of the OptiHub properties. First of all, understand the characteristic of sync signal that the connected slave device is expecting and configure the output source accordingly. All output signals can be inverted by setting the Output::Polarity to Inverted. For connecting more than one slave devices, output signals may be split using a BNC splitter. Exposure output signals to inform when the cameras are exposing. When the output type is set to Exposure Time, the sync hub asserts the output signals when the cameras are exposing, or shuttering, in the live mode. When the output is configured to Recording Pulse, the exposure signal is asserted only when Motive is recording. The Recording Gate signal can be used to tell the slave device when Motive is recording or not. When configured to Recording Gate, the sync hub will output a constant high voltage signal when Motive is recording. Please note that OptiHub is not specifically designed for precise synchronization, and there will be a slight delay when it starts outputting the trigger signal. This delay varies on each camera system setup. The gated (while-recording) output signal from the OptiHub is not frame-synchronous with the recorded frame data. When the recording trigger is received in the middle of a frame, mocap frames starting from the next one get recorded in the Take. The gate output signal, however, does not respect this and begins outputting the signal as soon as the recording trigger is received. For this reason, there could be a slight offset between the outputted gated signal and the recorded mocap data. The Pass-through type outputs the signal that is received through the SYNC In port. This page was last modified on 1 August 2018, at 14:22.